I made this costume last year when I was 8 months pregnant, wanting to incorporate my belly. I created a nest with cardboard, craftpaper and brown fabric that I had. I used dried tall grass and twigs from my yard and sewed them onto the nest. I tried hot glue initially but it didn't work. So, sewing was a must. It, miraculously, sat on my belly and stayed up. 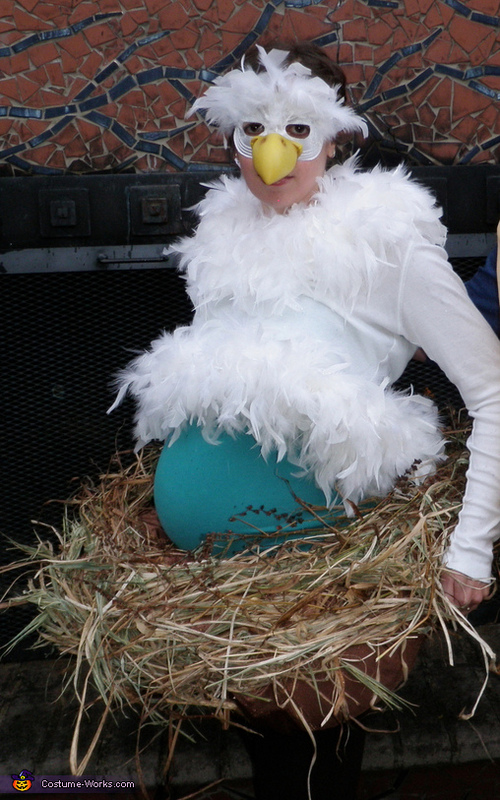 I cut off a white long sleeve tshirt and sewed a feather boa around the bottom and and the collar for bird feathers. I purchased a bird beak and a simple white eye mask. I sewed the beak onto the mask and glued individual feathers from the boa around the mask. I wore a blue tight tank top to mimic a blue egg.